By Eric Copenhaver (Department of Physics, University of California, Berkeley, California 94720, USA). I used to go camping with my family. We always chose to camp close to the water. I didn’t like reading when I was young, so I always got bored when my parents sat down to read books by the tent. Instead, I would go to the water’s edge and throw rocks into the water. I tried to skip flat rocks on the water for as many bounces as I could. I also liked to drop two rocks beside each other and watch the waves overlap. Have you ever dropped two rocks onto a pond at the same time? When they hit, each rock sends out waves, ripples in the water that interfere with each other into a pretty pattern as they criss-cross. But which rock hit the water first? After all, your two rocks probably don’t weigh exactly the same amount. You can even try the experiment now. You don’t even have to drop rocks into water. You could take two different coins (like a 5c and a 50c) and try really hard to see which one hits the ground first. Can you tell which hit first? Even if you think you know, consider all the tiny things that could influence your careful measurement. For example, are you sure that you dropped the two coins at the exact same time? Galileo, now over 400 years ago, thought he knew just what would happen in your experiment. He even disagreed with Aristotle, one of the most famous thinkers of all time. 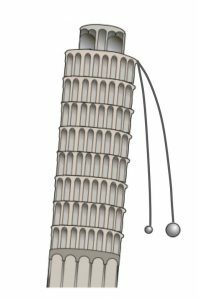 He was so confident that he marched up to the top of the famous Leaning Tower of Pisa to prove himself right. With a crowd below, he dropped two balls of different sizes from the same height at the same time. What do you think happened? To the crowd’s amazement, both balls hit at the same time. This would come to be called Einstein’s Equivalence Principle: gravity will pull the same on any two objects regardless of their material or size. That’s even true for a bowling ball and a feather, as long as you go into a vacuum chamber to remove the air resistance that normally holds the feather back. In a vacuum, a bowling ball and a feather truly do hit at the same time, which is hard to even picture. Check out Dr. Brian Cox’s video of that experiment to see for yourself. But ​do​ they hit at exactly the same time? 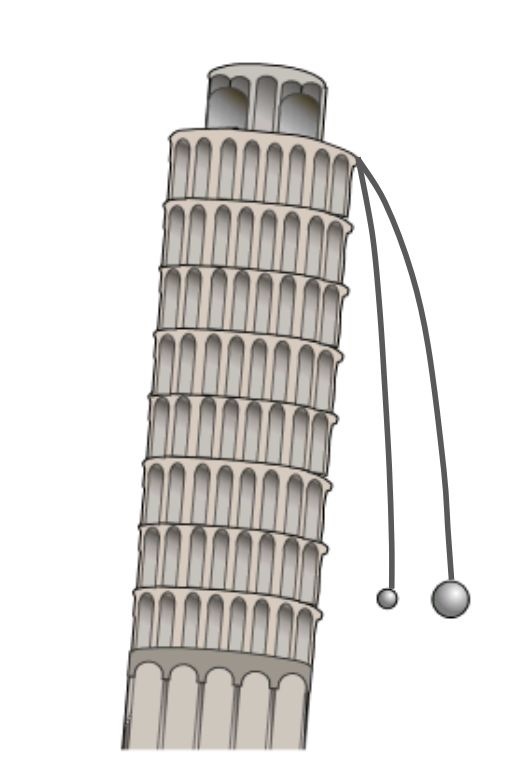 We physicists have reasons to think that the two objects might hit the ground at very slightly different times. One reason could be that there might be a force in the universe that affects one object more than the other, a force we have yet to observe. By looking closely for differences in how gravity pulls on each object, we perform a test of the Equivalence Principle. The differences we might observe in Equivalence Principle tests are really small, though. For example, if you were to drop two objects from your outstretched hands, you would need to be able to tell which one hit first within a size smaller than a single atom! And an atom is a super tiny particle. They are so small that there are about 100,000 of them across the width of one of the hairs on your head. (To imagine how big that number is, if you lined up 100,000 people shoulder-to-shoulder, they would stretch all the way from Sydney into Blue Mountains National Park. That’s how many atoms are across a single hair!) If we want to measure which object hits first ​that​ well, we need to be more precise than just dropping two rocks and watching them by eye. We need some tricky methods. We have just the trick in atomic physics: something called a “superposition”. An atom is such a tiny particle that it follows the unusual rules of quantum physics. One interesting property of quantum particles is that they don’t have to be in just one position at a time. That is very different from the rules that you and I must follow. We are always in one position at any one time. You can either be in a state of sitting in the kitchen or in a state of playing soccer outside, but of course you can’t be in ​both​ positions at once. A quantum particle, on the other hand, can be in an unfamiliar state called a ​super​position. In a superposition, it’s like one atom is in two different places at one time; it feels effects from both of those places at the same time. Let’s try to imagine what it would be like for you to be in a superposition. Let’s say that you are a messy eater and if you were sitting in the kitchen at 9:00 in the morning eating breakfast, you’d get milk on your lip and a brown chocolate smear on your cheek. If you were instead playing soccer at 9:00, let’s say you would get a green grass stain on both knees. In either case, you agree to be on the doorstep at 9:01. If you can be in only one position at once, you would arrive at the doorstep at 9:01 either with two stained knees or with a milk on your lip and a chocolate smear on your cheek. If you could be in a superposition, on the other hand, you might arrive at the doorstep at 9:01 with just milk on your lip and a grass stain on only one of your knees. It’s as if you were partially in both positions. It’s as if you were in the kitchen and playing soccer at the very same time. It’s as if you were in a ​super​position. Unfortunately, you can’t really be in two places at once. You and I can’t be in a superposition because we are made of such a huge number of quantum particles, like a billion billion billion atoms! All of those billion billion billion atoms would have to be in the very same superposition at the same time, which is very, very unlikely. Note: There are some details of superpositions this analogy does not fully capture. In my opinion, this example still gets to the heart of what is unfamiliar and interesting about superpositions. I admit, however, that many physicists have very strong and very different opinions on fair ways to talk about superpositions. In my lab and labs like mine, we actually do put an atom into a superposition [1,2]. We do this by hitting the atom with a carefully tuned laser. 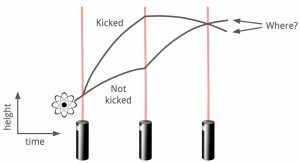 The laser puts the atom into a superposition of two states: (1) ignoring the laser and (2) feeling the laser and getting kicked upward by it. At this point in time, the atom is traveling two paths, one kicked by the laser and one that was not kicked. The atom’s paths are bent by gravity, just like a soccer ball you kick upward. If there was no gravity, the soccer ball would continue on straight forever. Since gravity bends the ball back down to Earth, we could measure how strong gravity is by measuring with a ruler how high the ball is after some time. 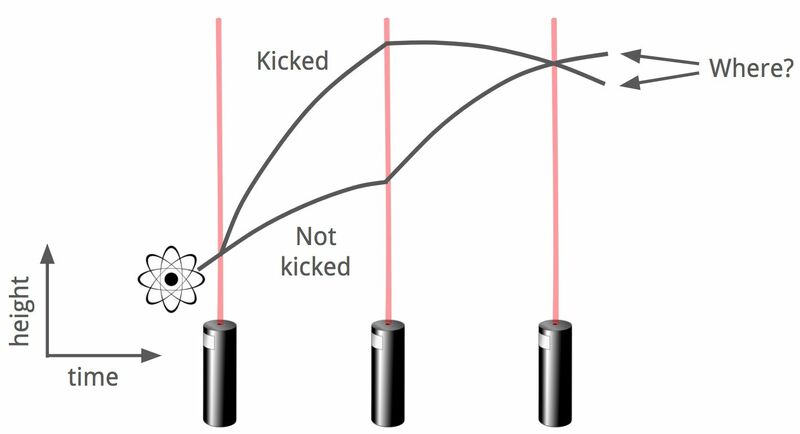 The laser we use to kick the atom also acts like a ruler. We use the laser as a ruler to find out how gravity pulled on the atom while it flew. 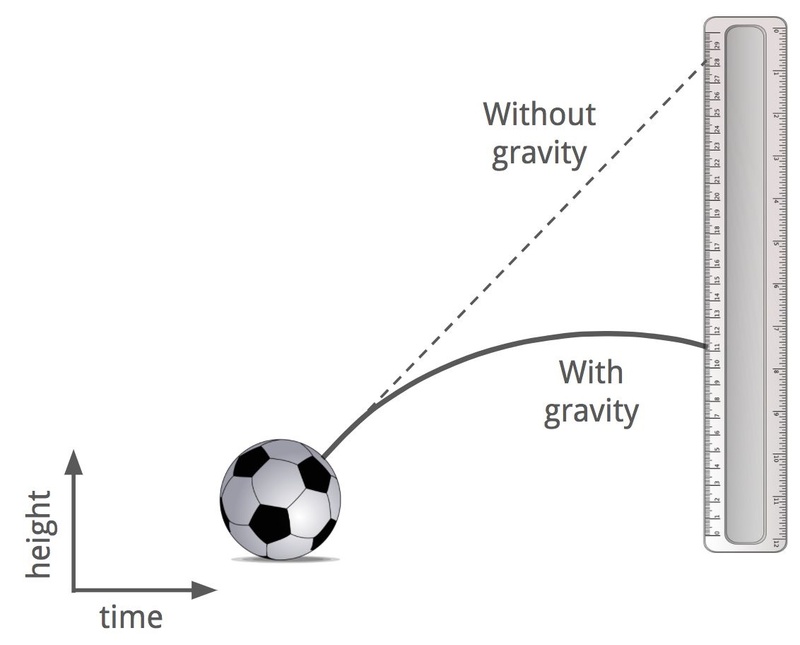 So why don’t we just use soccer balls and rulers to measure gravity? That’s because an atom actually behaves like a wave and we can use waves for really precise measurements, using how waves interfere. Just like the overlapping waves sent out by the two rocks on the surface of the pond, the atom’s waves from its two separate paths interfere when they overlap. This interference pattern only develops if the atom flew on two paths at once. The laser, which acts like a ruler, prints a pattern onto the atom’s waves. That pattern printed onto the atom’s waves is the signature of gravity. The device that measures this is called an atom interferometer. In the end, an atom interferometer measures that interference pattern by taking a picture of the atom to see where it ended up. Atom interferometers can perform a precision version of Galileo’s drop test. They can precisely measure how gravity acts on two separate objects. In this case, the two objects are two different kinds of atoms. Both a team in Wuhan, China, and another in Stanford, California, use different isotopes of a rare element called rubidium. Isotopes are different kinds of the same atomic element that weigh different amounts. While China currently holds the world record for precision, they have yet to see signs of a new force. The Stanford team has plans to do 10,000 times better. With the tricks of quantum physics and the precision of an atom interferometer, we may begin to see the effects of new forces in the universe by carefully studying how gravity pulls on different objects. We are testing Einstein’s Equivalence Principle. So next time you drop two objects from the same height, I invite you to look very closely to see if one hits the ground first. If one does hit first, consider if it’s because you had a measurement error or if it’s because you observed a new force in the universe. Next time you drop two objects, maybe while on a camping trip with boring parents like I was, stop to appreciate the deep mysteries of the universe that might be hiding behind such a simple experiment. The paper we were given was ‘Superpositions test if gravity pulls the same on two objects’. The paper talked about Einstein's Relativity Principle, which explains that two objects when dropped at the exact same time, even when their weight is different, will land at exactly the same time (if there is no air resistance). They are presenting the idea that this may be incorrect; they are saying that there may be a force that we are yet to observe that affects objects differently. To test this theory they are using the concept of a superposition to try and prove that Einstein’s Relativity Principle is incorrect. They do this by using a laser that is concentrated on an atom. This atom is in a superposition, and it is like the atom is in two places at the same time. It it both feeling the effects of the laser and ignoring it, which means that the atom is travelling two paths, one affected by the laser, and one not. The concept that the paper was examining is relevant to society and the scientific community because if they are able to prove their theory, it will completely change the way that the world looks at this scientific concept. 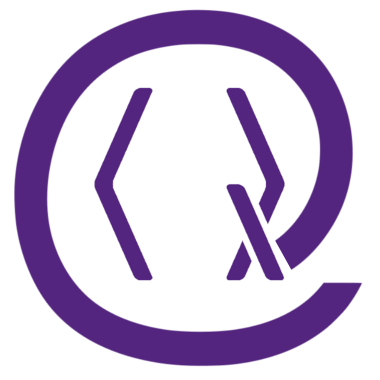 The paper was interesting to read as it explained a complex concept to do with quantum physics in terms that we were more or less understandable for people of out age group. We also appreciated the use of simple pictures, however we would like if it was a bit more clear and easy to understand depending on how knowledgeable the audience is, particularly the concept of a superposition. Otherwise, we very much enjoyed the paper. We rate the paper 4​.5​/​5 . I am so appreciative to have gotten the chance to get feedback directly from an underserved age group. Centering the peer review process on the intended audience is an ingenious and symbiotic strategy. In the first round of reviews, I was delighted to see how well the students correctly picked out the important points of my article, and glad to have gotten tips on where the article's clarity lapsed. I think an important way to improve science communication is to reach an agreement between experts on what's accurate and the audience on what's understandable. In an ideal world, I'd add a step to the review process where an expert can critique the accuracy of content in the article. Eric Copenhaver started college in Akron, Ohio, majoring in jazz guitar and aspiring to be a rockstar. After switching to Philosophy and taking Physics for a general science requirement, he dove headlong into Physics research. Now a Physics PhD Candidate at UC Berkeley, Eric works with Prof. Holger Müller on the first precision cold atom interferometer to use a lithium, a species with low mass and "simple" electronic structure. L. Zhou, S. Long, B. Tang, X. Chen, F. Gao, W. Peng, W. Duan, J. Zhong, Z. Xiong, J. Wang, Y. Zhang, and M. Zhan, Test of Equivlance Principle at 10-8 Level by a Dual-Species Double-Diffraction Raman Atom Interferometer, Phys. Rev. Lett. 115, 013004 (2015). Overstreet, P. Asenbaum, T. Kovachy, R. Notermans, J. Hogan, and M. Kasevich, Effective Inertial Frame in an Atom Interferometric Test of the Equivalence Principle, Phys. Rev. Lett. 120, 183604 (2018). On Crossref's cited-by service no data on citing works was found (last attempt 2019-04-25 22:15:21). On SAO/NASA ADS no data on citing works was found (last attempt 2019-04-25 22:15:22).